Stanly Ranch returns from funding limbo. The project would add another 500 low wage employees looking for affordable housing. It would also contribute $4.4 million to the city's affordable housing fund. 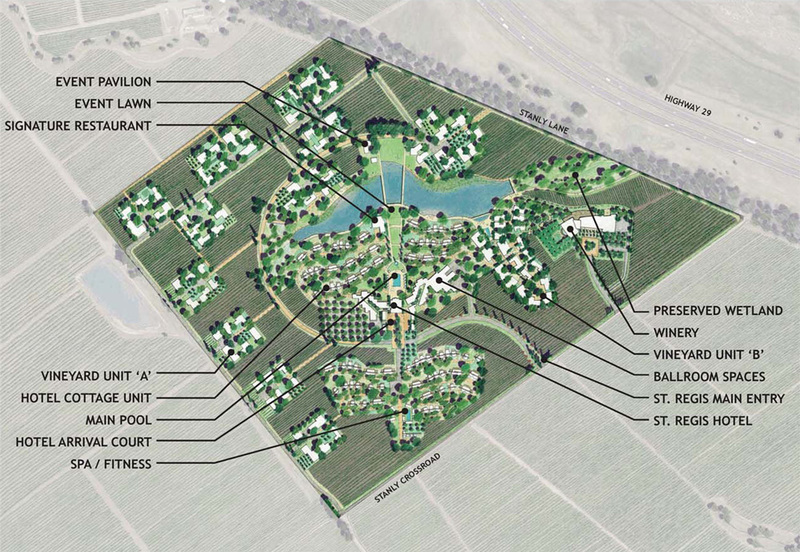 The cost of 50 units of affordable housing in Napa was just pegged at $24 million. By that standard the $4.4 million will be enough for 9 affordable housing units, enough to house perhaps 18 of the 500 employees. The continuing imbalance of jobs and housing in Napa County, increased with each new development project, is not sustainable. This is also another example of the trend toward the winery hotel that will eventually be demanded in the unincorporated areas just as restaurant wineries are now. Update 5/7/17: Only recently, after stumbling upon these documents, have I become attuned to the third mega-project that will be urbanizing the agricultural entry to the county just south of the Hwy 29 and 121 junction in Carneros. It is a housing project and resort known as Stanly Ranch. The project was approved by the City of Napa in 2010. Sometimes, until you see a site plan, the numbers representing the project in a table don't have an impact. A big chunk of vineyards at the approach to the Valley is to become suburbanized and another bit of Napa's forlorn effort to maintain a greenbelt separating the city from the sprawl moving up from American Canyon will disappear. How the parcel became a part of the city needs a bit of research. As a far-removed extension of the urban-rural limit line, it seems to violate every concept of maintaining the separation between existing urban and rural uses that the county and cities have been committed to since the ag preserve and Measure J were enacted.